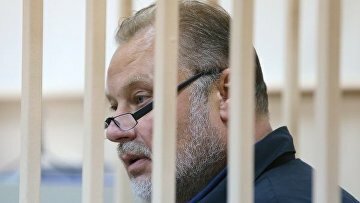 Probe into ex-penitentiary official Korshunov completed - investigators | Russian Legal Information Agency (RAPSI). MOSCOW, February 25 (RAPSI) – The Investigative Committee of Russia has completed a probe into ex-Deputy chief of the Federal Penitentiary Service (FSIN) Oleg Korshunov and his alleged accomplices, the authority’s website reads on Monday. According to the Committee, investigation has been completed as concerns Korshunov and two other FSIN officials, Svetlana Alekseyeva and Alexey Danilov. The respective criminal case is ready to be submitted to a court for examination on merits, the statement reads. Currently, Korshunov is a defendant in several criminal cases where he stands charged with embezzlement of 160 million rubles (about $2.5 million), abuse of office and bribery. Investigators claim that in 2015 through 2016 Korshunov and Alekseyva conspired with businesswoman Marina Dyukova to steal budget money allocated for centralized purchase of sugar and fuel for penitentiary facilities.